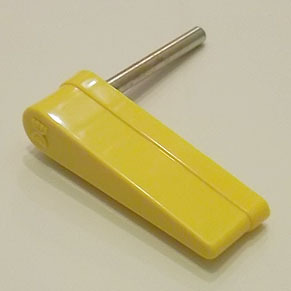 3-inch long 1-piece plastic molded yellow flipper bat and metal shaft with Data East ("DE") logo on top. Used on many Data East games, but can be used on most makes/models including Sega, Stern, Game Plan, Atari, and possible others. Also replaces Bally/Williams part # 20-9250-6, 20-10110-6, and others.